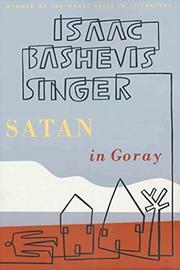 A strange story for modern readers of a tiny town on 17th century Poland, where first the Jewish population is decimated by the marauding Cossacks- then, as they creep back to reestablish their homes and businesses, comes the news of a Messiah, in the person of Sabbatai Zevi. The townspeople approach the High Holidays with asceticism, in expectation. When the Messiah does not come, they turn to religious hysteria and license. And, central to this, is the story of Rechele, crippled, epileptic, but still desired of men. She has wed one man, but he has failed her. Reb Gedalyia, who had brought news of the new Messiah, sends her husband and another on a mission; he moves in with Rechele, and so opens the door for Satan, who possesses her as a fiend, a dybbuk. As the devil's bride she is tormented and defiled, and- with the return of the missionaries and the word that Zevi, presumed Messiah, has taken the fez, the townspeople seize her, and the story ends with the ritual of exorcism- and her death. A weird tale of religious hysteria and mania, of superstition and violence. For a very limited audience -- not that of his contemporary novel, The Family Moskat.